As China began its economic reforms in the late 1970s and made a transition from planned to a market economy, corporate governance of the banking sector became an increasingly pressing issue. Further, in the aftermath of the Asian Financial Crises in the late 1990s, Chinese authorities became acutely aware of the importance of corporate governance to ensure that their banking system would not suffer similar fates to those of other Asian countries. This book examines corporate governance in city commercial banks, which are the main source of loans to the dynamic small and medium enterprises that are crucial to the development of China’s economy. By the end of 2008, there were 136 city commercial banks in China, 13 of which had foreign partners, and this book clearly demonstrates the positive effect of these foreign partnerships on corporate governance practices, in addition to financial performance. 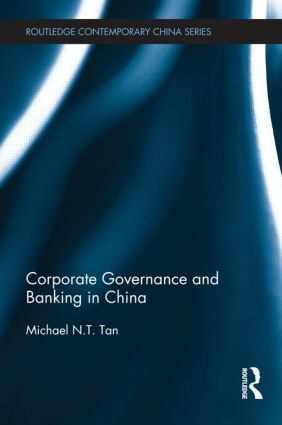 With evidence from extensive interviews with 10 city commercial banks in China, Michael Tan explores the different models of corporate governance, and in turn, asks which model is most suitable to China, how are Chinese authorities overcoming problems with corporate governance, and how do these problems compare with those in other transition economies? Whilst the primary focus of this study is on China's city commercial banks, there are lessons that apply much more broadly to the industry and it therefore will be invaluable to foreign banking institutions wishing to invest in China. This book will also be of great appeal to students and scholars of Chinese business and economics, corporate governance and banking. Michael Tan was awarded his PhD by the University of New South Wales in 2011 and currently works as a Financial Planning Specialist for Michael Tan & Associates in Australia.